Update, October 4: Rainbow Six Siege’s new recoil is on its way, with a new video illustrating the way some of the changes will work. Rainbow Six Siege’s recoil mechanic is changing, and a new fan-made video attempts to show how those changes will actually work once they’re implemented in the game. Fancy getting into Siege? Here’s our look at the best Rainbow Six Siege operators. The video, posted to Reddit, shows that the new recoil patterns are definitely becoming more uniform. While there’s some change in individual bullet spray, a gun will always kick up in the same way every time it’s fired. That means that shots will, in theory, sync up horizontally, and the distance between the first and second shot will always be the same. As you can see in the video, there is still some randomness – horizontal spread isn’t patterned, which means that while the vertical distance between shots won’t change, horizontal difference will. That means that while the changes have been linked to CS:GO’s weapon spray, Siege does seem to have its own unique system. Update, September 22:In an update on the game’s official subreddit, Rainbow Six Siege’s community manager made clear that the developers are listening to feedback for future changes to the recoil system. The alterations to Rainbow Six Siege’s recoil are going to make some fundamental shifts in how the game operates, and some of the specifics have players pretty concerned. In anupdate, community manager Matthew Szep says that the game’s developers are well aware of these concerns and are working to address them. That includes the randomness that appeared in the initial trials on the TTS, as well as the feel of the guns and the potential the new recoil system has to lead to an increase in the use of macros. Expect to see a second iteration of the new recoil system soon. Update, September 21:Ubisoft have clarified the changes being made to weapon recoil in Rainbow Six Siege. Rainbow Six Siege is bidding farewell to randomly-generated recoil, instead paving the way for “more precise recoil patterns.” In a dev blog published yesterday, the game’s developers explain what the changes will revolve around, why the changes are being made, and how different weapons will be changed based on their class. Previously, the difference in field of view between weapons, consoles, and PC, meant that changing anything about the game’s first-person perspective resulted in bullets not always landing where the reticle was, sometimes by significant margins. To combat this, Ubisoft is introducing multi-stage recoil, which lets the team define multiple recoil data sets. According to the post “that means that we have a perfect control over where every bullet goes, with no other RNG involved. With this system, we were able to create much more precise recoil patterns.” Think of something akin to the recoil system in Counter-Strike: Global Offensive, in which every weapon has its own unique recoil pattern. The changes to recoil are currently live on the game’s technical test server, but we do not yet know when they will be fully introduced. Original story, September 20: Rainbow Six Siege’s next technical test server goes live at 13:00 Eastern (18:00 BST) today. It includes buffs to two operators, a wide-ranging adjustment to recoil on automatic weapons, and a range of technical and gameplay fixes, which are pretty sorely needed after all the bugs added in the latest expansion. The hashtag #BuffBlitz2017 is finally getting answered as both Blitz and Kapkan get some love. 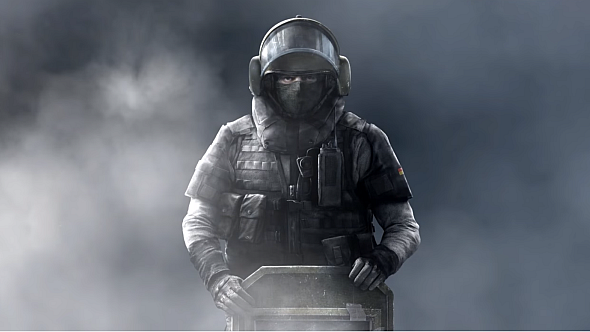 Blitz will be able to move more quickly with his shield up, while Kapkan is now more nimble and has has become “a two-speed operator.” He can also carry more of his traps, but they no longer deal lethal damage (their laser has also been removed). Those are some surprisingly hefty changes, but judging by the comments, the recoil changes have stirred the most controversy among the community. At PAX West earlier in the month, the devs announced that random recoil will be phased out from Siege, to be replaced with “predictable recoil patterns” for all weapons. The devs hope that you’ll learn those patterns in time, making shooting more skill-based. Understandably, this has been widely interpreted as a pitch to CS:GO players, and has generally been received with scepticism. For better or worse, you’ll be able to test the new patterns in the coming TTS. Lots of networking tweaks are also being tested as Ubisoft continue to push Siege’s competitive credentials – hit validation, latency alignment, pawn-to-pawn physics, and replication are all being improved, and players are getting four new icons to display the quality of your ping, connection stability, FPS, and host stability. Finally, some fixes for gameplay issues around vaulting, explosions, and gadgets are also being tested, as is a “tentative” physics fix for various collision-related issues, such as player clipping, shield vaulting, and drones. Ubisoft are thin on the details here – as you can see in the full post on Reddit – but for a more detailed view of the issues introduced by new expansion Blood Orchid, click here.